Making the decision to buy this horse was a “no-brainer.” William is a huge Royal Shake Em fan and the first Lanes Leinster horse I ever saw, I fell in love with and can remember how it moved to this day! Quint is total eye candy on top of her fabulous pedigree. 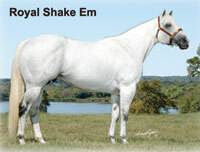 Quint’s sire: Royal Shake Em SI-104 stakes winner of $257,009 Sire of 544 Rom, 36 stakes winners, earners of over $8.8 million. 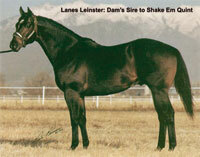 Quint’s damsire: Lanes Leinster was an outstanding individual, he had a 101 Speed index, was a Stakes Winner of 4 Races, $342,780 and Sire of 186 ROM, 15 Stakes Winners. 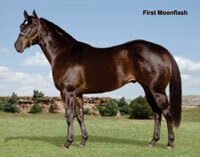 Sire of Earners of over $1,815,238. He can be found in the pedigree of many great barrel horses as well. 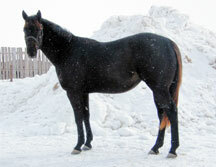 This mare is only 3, stand 15.2+ and looks like she’s going to grow a little yet. She’s seal brown with the neatest copper colored tail. Real clean headed and a tidy looking mare.